Pride is one of the seven sins. An Australian friend told me that being called a “tall poppy” is akin to being “too big for your britches” or “having a big head” in the U.S. Apparently no matter where you are in the world, feeling a sense of pride isn’t socially acceptable. What’s wrong with feeling deep pleasure or satisfaction from your own achievements? If “the sin of pride” is the result of an inordinate amount of self-esteem, does having no pride result in zero self-esteem? Exactly who decides what is too much or too little pride? As I grow older, I decide for myself. Last week my sister-in-law and I popped into an antique store, something out of the ordinary for me. I have enough stuff, but, I didn’t have one of these. 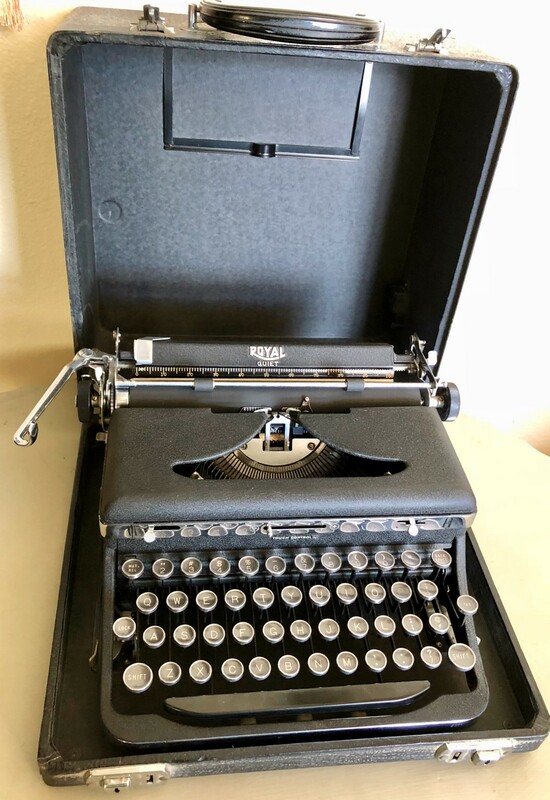 <<This is a mint condition 1949 Royal Quiet typewriter with Hemingway keys. I’ve been wanting one for a long time. The store owner asked me if I was a writer. Have I published a book yet? No. I have been published in an anthology and a magazine, though. I have a website and I write here. I have several works in progress. It took some time to believe it. You gotta name it to claim it! I feel good about trying something new in my Third Age of Life. Renee Magnusson taught me how to rejoice in my accomplishments on her Seven Sins Tour. I’m not going to give up until I finish a book or die trying. You better believe I’m going to brag about it, too. So, dear reader, what do you want to celebrate? Are you reluctant to brag about it? Why? Tell me all about the marvelous things you do. I want to know.